Background & Objective: Toxoplasma gondii infection has public health importance and can lead to serious diseases in immunosuppressed patients, such as HIV cases. Appropriate control of T. gondii infection in HIV patients requires information about the prevalence of T. gondii antibodies and DNA in different population. 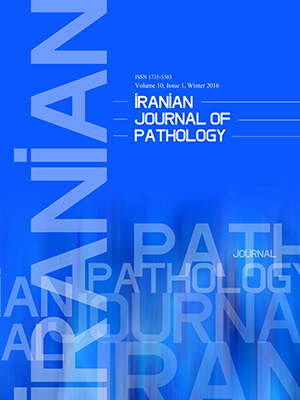 In this study, we aimed to determine the prevalence of Toxoplasma gondii antibodies and DNA in HIV patients in Tehran, Iran. Methods: A total of 149 HIV patients from the Iranian Research Center for HIV/AIDS, Tehran, Iran were enrolled in the study. Anti-Toxoplasma IgG and IgM were detected by ELISA and T. gondii DNA was evaluated by PCR and quantitative real-time PCR. IgG positive samples were also assessed for their avidity. Results: Anti-Toxoplasma IgG and IgM were positive in 46.3% and 2.7% of cases respectively. 92.7% of our patients showed past infection and 4.3% revealed recently acquired toxoplasmosis based on their IgG avidity test. T. gondii DNA was not detected by PCR but real-time PCR results showed DNA in 4.7% of total patients and 13.1% of the IgG seropositive cases. Conclusion: Our findings indicated that latent toxoplasmosis was relatively prevalent in our study population, but new T. gondii infection had low prevalence. Almost half of our patients were IgG negative and at risk of acquiring toxoplasma infection. Low copy numbers of DNA were detected in 4.7% of the cases without any clinical manifestation. Therefore, detection and monitoring of anti-Toxoplasma antibodies and DNA in HIV patients is substantial to estimate the risk of reactivation and new infection.